Turns out we’re not alone in the universe. The bad news is, the aliens aren’t what you’d call “friendly” or “peaceful.” In fact they’re quite hostile, and bent on conquering Earth. The really bad news? Earth is woefully unprepared. We don’t have starships, or a planetary defense grid, or giant death rays pointed at the sky. We’re sitting ducks. Fish in a barrel. Oh, you wanted some good news? This is all I’ve got: we’ve assembled humanity’s best and brightest. The sharpest commander, the smartest scientist. We’ve formed a team to scramble Earth’s defenses together and make one last stand. Can you hold off the invasion before it’s too late? 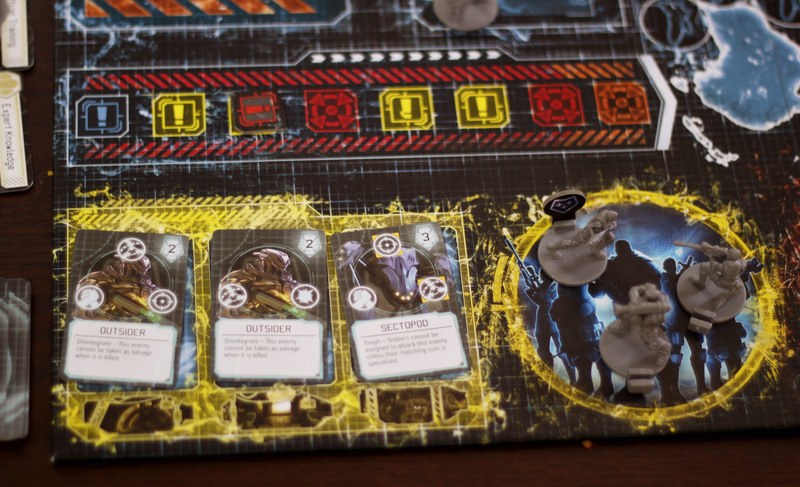 XCOM: The Board Game is a cooperative game in which a team of four players is tasked with defending earth against an alien invasion. With a limited budget you’ll need to research new tech, shoot down alien ships from the sky, defend the XCOM base from alien incursion, and send teams to complete missions in order to end the invasion once and for all. The game has two phases: the timed phase and the resolution phase. In the timed phase, the game’s companion app manages the flow of the game. It posts one action at a time (which the Central Officer is responsible for reporting to the rest of the team), and tracks how much time is available for said action. These actions include assigning units for defense (interceptors for each continent, Satellites for orbital defense, soldiers for the XCOM base), selecting new technology to pursue, assigning scientists to research those techs, and sending soldiers out on missions to fight back against the invasion. You also get a budget assigned to you each round which limits the number of units that can be played. 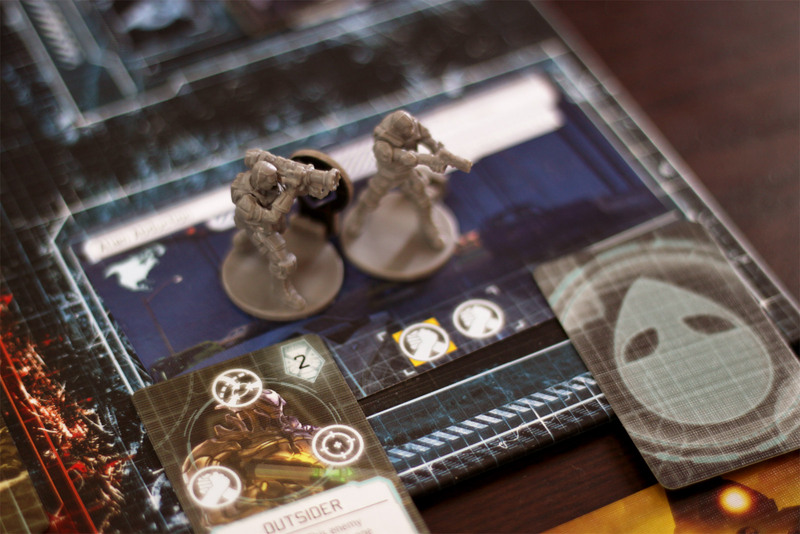 Of course, these actions are intertwined with enemy actions – adding UFOs to the globe and to orbit, sending alien troops against the XCOM base, and adding Crisis cards to a stack that resolves at the start of the resolution phase. While each XCOM action definitely occurs at some point in each round, the Alien actions vary a whole lot more. One round you might get 1 crisis card, 8 UFOs, and 2 enemies in the base, while the next you’ll get 2 UFOs, 1 Enemy, and 10 crisis cards. Thanks to the app, The actions come in unpredictable ways each round, keeping players on their toes. In addition, the global situation – how many continents are nearing panic, how many UFOs were in orbit, whether or not you completed a mission – can affect the details. For example, you might get less budget, or you might have to assign soldiers before you know what you’re defending against. Eventually, the timed phase ends, and then you have a resolution phase to see how well your defenses hold up. In the Resolution phase you’ll resolve all the Crisis cards (they do nasty, mean things), and then you’ll roll dice to research tech cards, destroy UFOs with your interceptors and satellites, defend the base, and attempt to complete the current mission. When you roll, each task is its own miniature push-your-luck event. 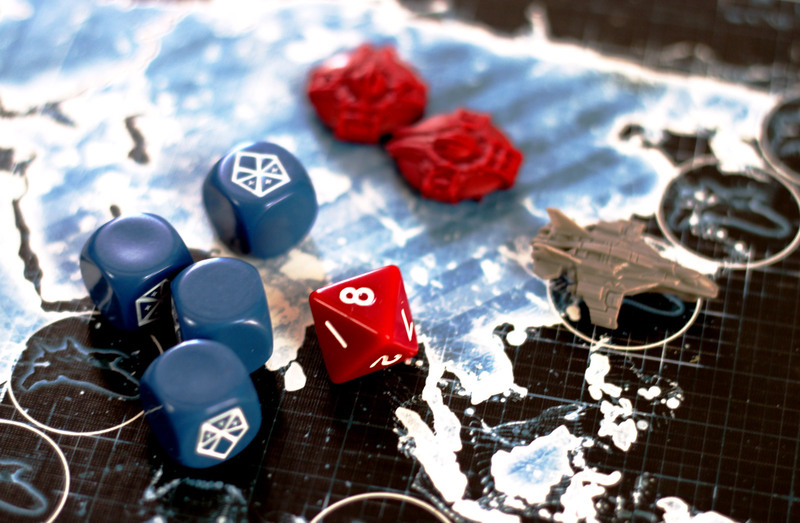 You roll blue dice based on the units assigned to a task, along with an 8-sided Alien die. When you roll, you count up your successes and add those successes to the task. If you have enough successes to complete the task, hooray! If not, you can roll again, but the Threat level increases. If your red die is higher than the Threat, your units are fine and can roll again. If the value is equal to or lower than the threat, you still count all successes for the roll, but your units are disabled or destroyed and you can’t roll again. You can always choose to stop rolling before this happens if you want to keep your units alive. Fortunately, the threat level resets to 0 for each Task. Also, successes on Missions or Research stick around, even if you don’t complete the task. When Scientists or Satellites are disabled, they’re basically unusable for the next round but they come back automatically. Soldiers and Interceptors are destroyed and go to the recruitment pool, and you’ll need to use tech cards or come in under budget in order to get those units back. Enemy units left on the board after defenses are rolled do very bad things. UFOs increase the panic level of the continent they’re attacking, and alien soldiers do damage to the XCOM base. After a certain number of rounds have passed (possibly shortened by completing missions), the Final Mission becomes available. The final mission is just like a normal mission, except far more difficult. Fortunately, the players do have a few other things in their toolkit. 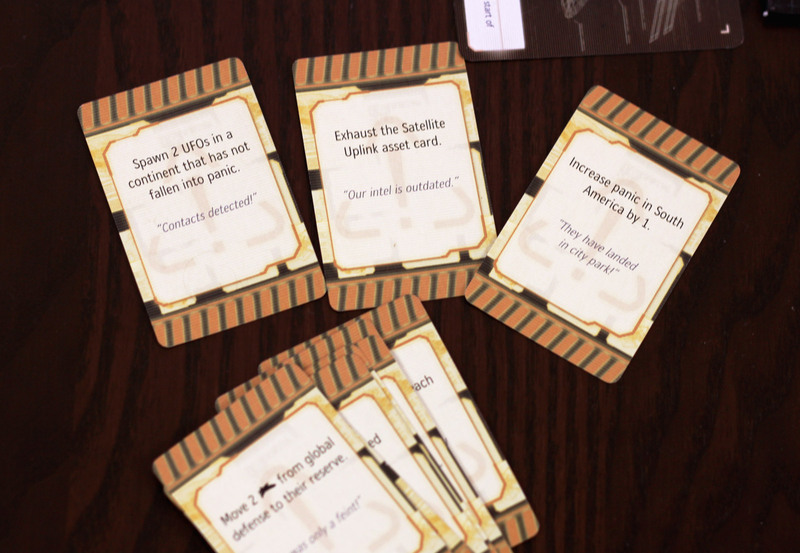 Each player has a role with specifically defined responsibilities: the Central Officer relates info from the app and assigns Satellites; the Commander tracks the budget and must keep the team from exceeding it, as well as assigning Interceptors and choosing Crisis cards; the Chief Scientist chooses technology to research and assigns Scientists; and the Squad Leader chooses the mission and assigns soldiers to defend the base and pursue the mission. Each of these roles starts with a few extra abilities that can be used out of turn, to help turn the tide of battle. For example, the Central Officer can use satellites to reposition UFOs or XCOM units for a more strategic defense. The Commander has a special emergency funding card with extra money that can be pulled once per round when they really need it, and they can also train soldiers to become Elite to roll additional dice in combat. The Squad Leader can use a couple soldiers to remove a Crisis card. 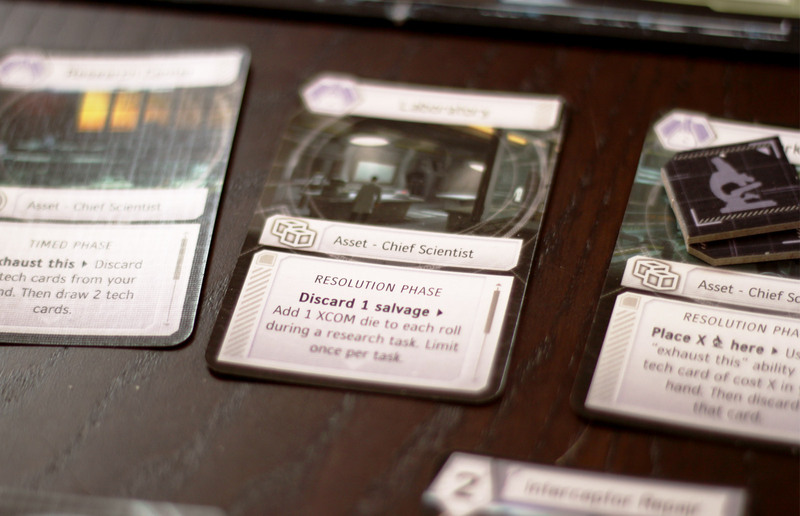 The Chief Scientist can use salvage from destroyed enemy soldiers to roll more dice for tech research, as well as use Scientists to play a tech card directly from their hand for a one time use (instead of a permanent ability). As the Scientist researches new tech, these cards go to specific roles and grant them new special abilities, including scoring automatic successes, refreshing the Emergency fund, or increasing the odds of success for a task. 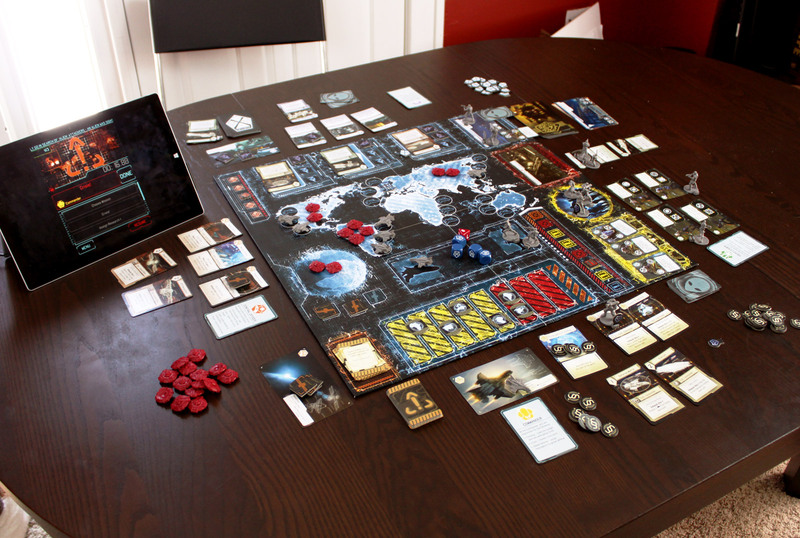 The game ends in one of three ways: either the XCOM base is destroyed (You’re all dead and can no longer defend earth; a loss), two Continents are in full-on panic mode (the world loses faith in XCOM to defend earth, pulls the budget, and surrenders; a loss), or you complete the Final Mission when it becomes available (you deal a crippling blow to the enemy and send them packing, victory!). Now is the perfect time to panic! Every once in a while some game comes along and does something totally new, adding a whole wealth of new options and mechanics to the game designer’s toolkit. Caylus apparently invented Worker Placement, and most of us have heard of Dominion, deckbuilding, and many of the games that followed on its heels. And of course with every new mechanism, some people will love it and some people will hate it. 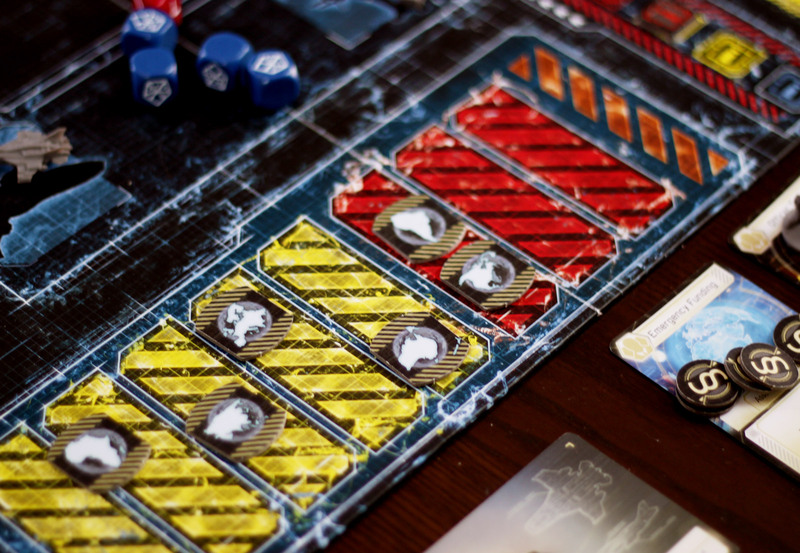 XCOM: The Board Game gives us digital app integration with a board game in a way that’s never been done before. It’s not just a reference sheet or a calculator; it’s a core part of the experience. Of course, there’s a risk inherent when you mix cardboard and digital. 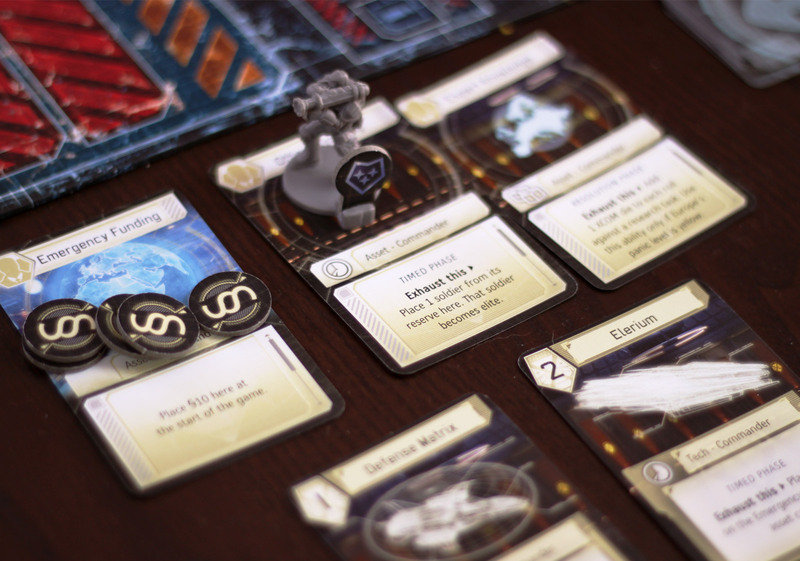 Are you getting an app that just happens to have a few physical components, or are you getting something that’s still a true board game with the app simply serving as another form of component? 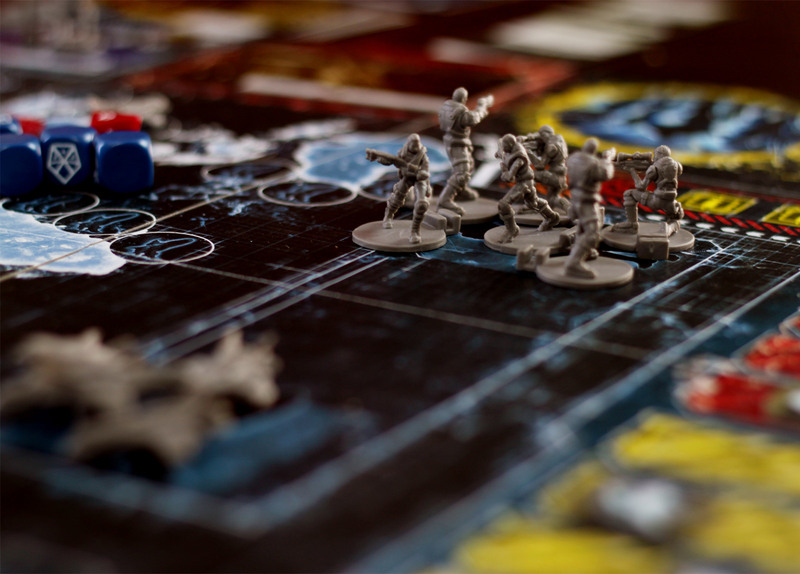 A lot of us play board games to step away from the trigger happy, reaction based frenetic pacing of video games, and maybe a crazy video game with board game components isn’t all that appealing. 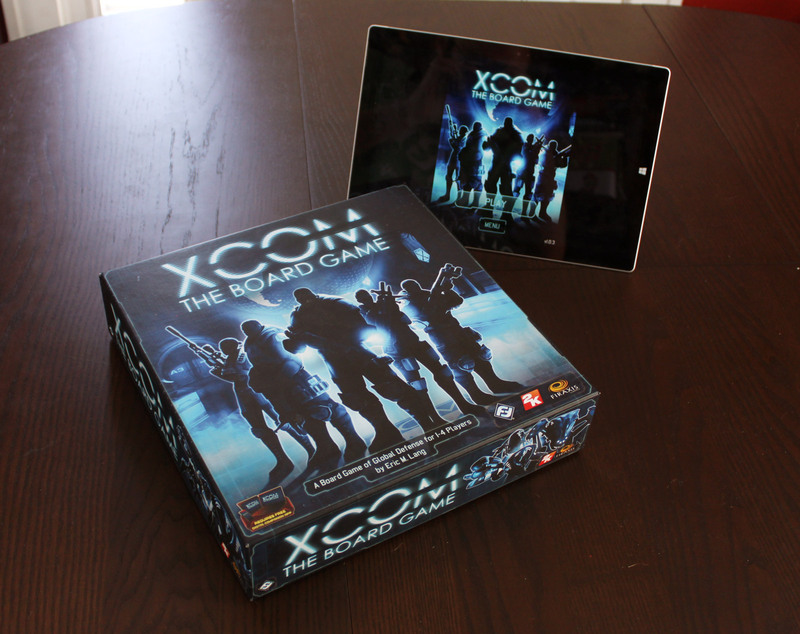 Fortunately XCOM lands squarely in the camp of Board Game, and the digital app is expertly integrated as another fun component in this excellently produced game. It’s integral to the experience, yes, but it simply takes real-time games to the next level. It’s a huge step beyond the audio CD tracks of Escape: Curse of the Temple or the closely comparable Space Alert. Yet while the app is the big story hook here, what really matters is the underlying game system. Once you get past the glamour of shiny tech, is there a substantial experience here? Yes. Yes there is, friends, and allow me to walk you through it. XCOM is difficult, for sure. Unless you get a bunch of rules wrong (it can happen, it’s a real time game we’re talking about. You tend to miss things especially in your first couple of games) you’re probably not even going to win the Tutorial in your first outing without a decent amount of good luck. Yes, I said tutorial. Here’s a beautiful thing about this big ol’ thematic game: the app teaches you how to play, as you play it. There is no printed rulebook included in the box. You get a quick reference sheet to help identify components and set up the components in the right order. After that, you’ve got the app. Fantasy Flight Games has really been making strides more than any other company to get people playing their games almost immediately out of the box. Legends of Andor had a tutorial scenario and specialized components to learn the game by playing with scenario cards gradually introducing all the rules. Star Wars: X-Wing had quick play rules which gave you the basics so you could throw down immediately and get the advanced rules later. 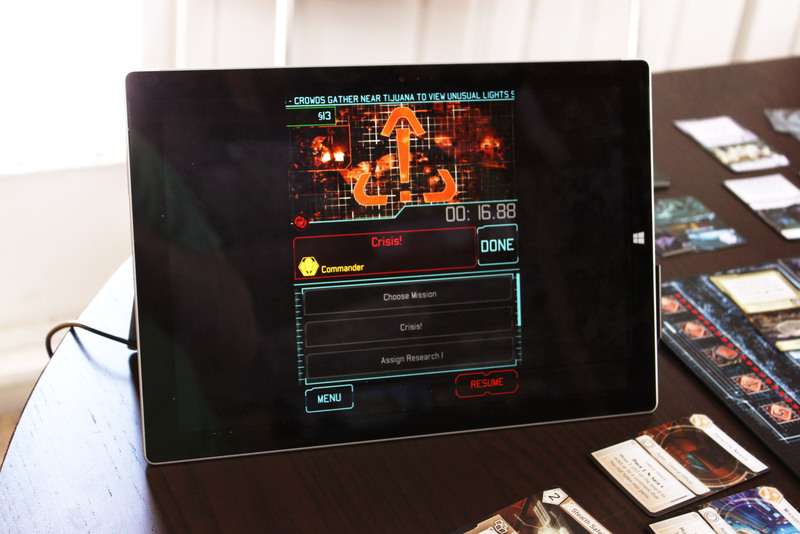 For this outing, XCOM already requires the app, so a tutorial mode is only natural. As a result, I literally opened the box in front of my friends and we set everything out and jumped right in to playing the game within minutes. Sure, the first game took a longer time to play as we figured things out, but we were playing right away. The tutorial worked. (The app does include a complete rules reference that can be accessed during gameplay, and FFG released a PDF rules overview so players could look up rules easily outside the game; let’s be honest, there’s a lot going on here). The commander’s abilities plus a few tech cards added. Train up elites to increase your victory chances! Sure, at first it may seem heavily reliant on the luck of the die. I mean, that happens in a lot of games; you don’t really understand the system, so it seems like all you can do is hope to roll well. But I’ve found you can learn. The luck, the rolls of dice, are actually weighted pretty well. Enemy in the base! So… many… enemies! Then we played again, and again. Eventually we won. The insurmountable became achievable. We learned, but we had to experiment and play around to do so. We tried different roles. We toyed around with how we fought the UFOs or defended the base. We started to learn how to make sacrifices, or when to stop rolling and take a few hits in order to save our Interceptors for next round. We’ve since moved up to Normal difficulty, which frequently blasts us. But we’re still learning, we’re still experimenting. We played on Hard mode once, just to see what it was like. It was crazy, but it was exhilarating. Of course we got crushed, but I have so much fun whether I win or lose, it’s worth it to keep playing and exploring the system. The point I’m trying to make is, whatever rolls you get on your dice, it’s up to you and your team to make good choices. You have a lot of agency, and though the rolls can on occasion royally crush your ability to win, most of the time victory is under your control. You can roll poorly and still play well enough to scrape a victory. You can also play poorly, roll just fine, and still lose. In a way it’s all very thematic; sometimes the alien invasion is just too much and despite your best efforts, the aliens are going to get you. Another thing that helps the gameplay is that as the game goes along, you rely less and less on the dice. In the first round it’s all about rolling the dice, but soon you’ll get new technology that gives you automatic successes. You’ll be able to use satellites to auto-destroy UFOs, or Interceptors to pull off air-strikes against enemy troops. In our most successful games, we barely even roll dice for the final mission – it’s all about allocating your advanced weaponry to just clean out your enemies and pass your mission tasks. I don’t think you’re ever invincible, but those things go a long way to give you control over your destiny by the end, if you can just hang on long enough. These are all reasons that I enjoy playing the game, but why do I love this game? It’s the theme. Or, more accurately, the level of immersion into the theme. XCOM is vibrantly thematic, drawing you completely in to the point where you automatically think of your actions in terms of the theme and not the mechanics. You’re not rolling dice, you’re researching valuable tech. You’re sending your squadrons out to stop alien ships. You’re defending the base. Whether it’s the commander using the budget to command the other players (“Don’t you dare use more than 2 scientists this round!”) or the Central Officer shouting the app reports at the other players (“Commander, choose a crisis! You’ve got 4 seconds!”), it’s completely immersive. It’s a losing battle and the odds are heavily stacked against you, and you’ve got to hold on just long enough to punch back. Thanks to the app, the invasion feels dynamic and very threatening. Continents get into the red panic level and you start losing budget. UFOs stack up in orbit and you have to start guessing how many troops to place before you see everything coming at you, because your satellites are jammed. One round you’re hit hard with UFOs and the next your base is drowning in enemy soldiers. 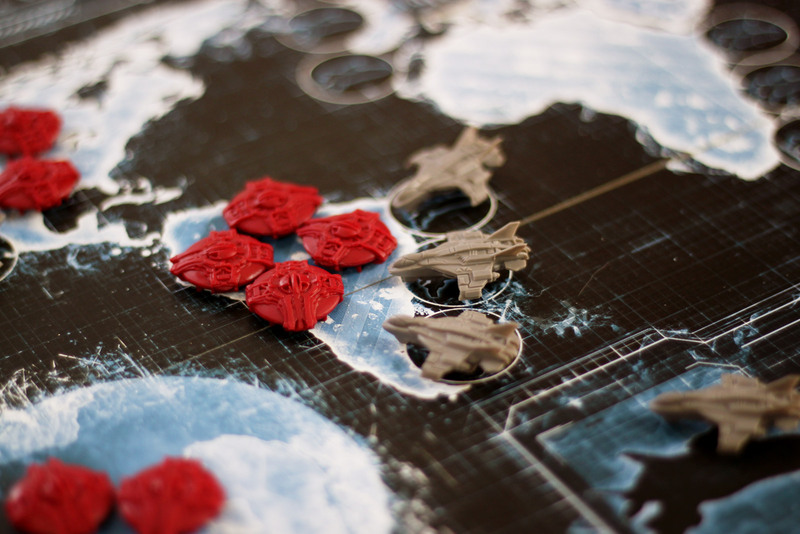 It’s controlled chaos – each of the 6 Invasion Plans gives the enemy different tactics over the course of the game, so you’ll have to learn each of the plans to properly plan and succeed. Even better, you don’t have to worry about a really lopsided invasion one way or the other. Pandemic may not have dice, but with a bad shuffle on the Infection cards you can lose in 2 rounds without having a chance to do anything. Here in XCOM you always have a chance, because the app is a bit smarter than a deck of cards. That doesn’t mean you won’t have a really desperate fight on your hands – especially if you let too many UFOs live and then get shoveled with even more in the next round – but you’re not going to lose instantly. Unless you play very very poorly. UFOs in Orbit; the WORST. Hopefully your satellites can take them out. All of these elements mix together neatly and the result is an epic climax every game. Even when we’re desperately losing, we don’t give up, because it feels like there might be a chance. We put all the UFOs in Europe and let it go to panic while saving the other continents, because the current mission will reduce panic in Europe if we complete it. We go all in on the final mission, knowing if it fails we’re up the creek with no backup plan. We do whatever it takes to win, and sometimes it’s not enough. But it’s always exhilarating. I remember terrible losses where we managed to get every continent into full-on panic and get the base destroyed in the same round; I remember epic last-minute victories where 2 continents are in full panic (a loss trigger) but we manage to complete a mission, reducing one of them out of panic just in time to complete the final mission and win the game after all. Every game, we learn something. We get better. It’s addicting and I can’t wait to get up to Expert mode, but I’m going to enjoy the ride. Did I mention the components? I should. They’re great. 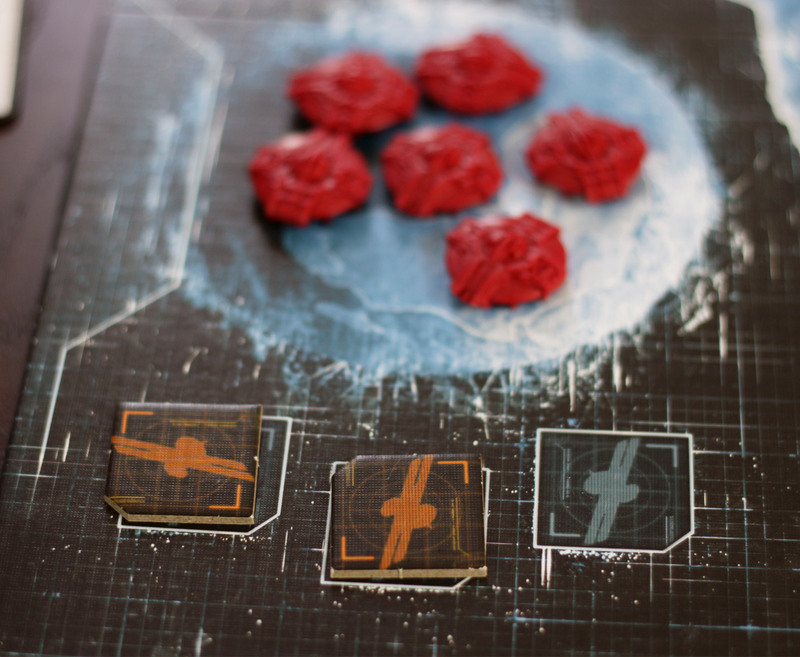 Plastic minis, a beautifully designed sci-fi board, nice cards. There are a few things that could stand to be tweaked – the silhouettes of the soldiers aren’t as distinct as you’d like when looking down on them. It’s amazing how much Australia, Africa, and South America look alike when isolated on a token, and during the timed phase you might mistake which continent is where on the panic track when deciding where to move UFOs, which can be frustrating. I also feel like the card text could be streamlined a bit – they’re formatted nicely, but the cost could definitely be shortened to simply an icon or the word “Exhaust” as needed rather than a sentence. At least you have text to reference to remember all of your abilities, and you get used to the cards based on the images. Overall the app is pretty great. It takes a round to get used to, but it’s very cleanly designed and the rules for any particular action are available at the press of a button. It’s also very unobtrusive – you don’t need to set it up so the whole table can see it, you just need the Central Officer to have it, so a laptop can easily sit on someone’s lap if you don’t have the table space or a smartphone. Side note – I highly recommend using a tablet or touchscreen laptop if you can. The larger screen just feels so much cooler. It works fine with a phone, though. There are a few features that aren’t immediately apparent (one button will show you upcoming UFO placements a few rounds ahead of time, because, I don’t know why. I also just learned that actions happening out of order due to UFO scrambling are highlighted in yellow). I have only one complaint – while each action in the resolution phase has a description, there are a few rules details that don’t show that seem like they’d be useful. The primary detail I can think of is that, when a continent is in full panic and you update the app, you’re supposed to move the UFOs in that continent into Orbit. It’s really easy to forget, and there’s no reason the app couldn’t say “Hey don’t forget to move those UFOs!” when you push a continent into Panic. Missions can save the day by shortening the rounds needed to unlock the final mission. Well, no, that’s it. XCOM is extremely fun to play, thematic, immersive, strategic, exciting, dramatic, and a bunch of other words that I’m not going to list because this sentence is getting ridiculous. It was worth the anticipation. 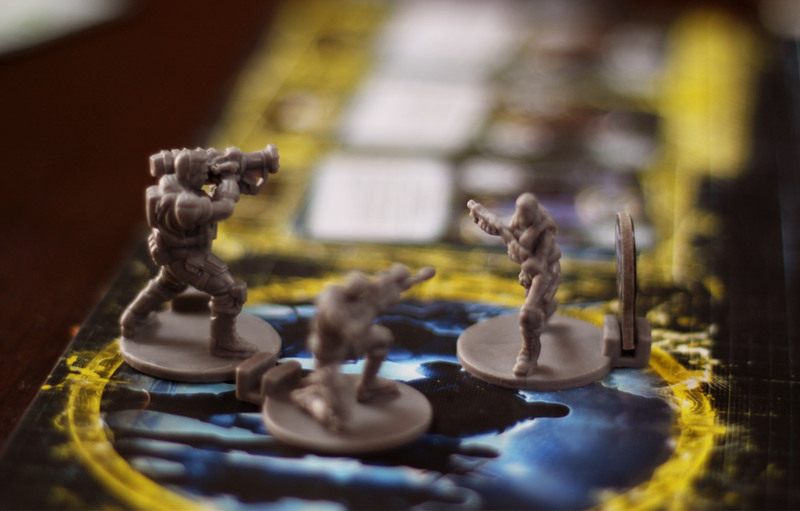 Perhaps even more importantly, XCOM has shown that app integration with a board game can work in an unobtrusive way that makes the game even more immersive. I don’t want every game to have a companion app from now on, but it will be exciting to see what amazing things designers come up with using an app to streamline or enhance their game. Maybe we’ll tire of this game eventually. For now at least, it’s a blast, and I love every play of it whether we win or lose, whether we barely scrape by or get thrashed in three rounds. It may not be the style of game that appeals to everyone, but it’s definitely the game for me. Bring it on. A few minor component quibbles. Great review. I’ve only worked thru the tutorial and tried a game solo playing each role. I to enjoy it but find the lack of a paper rule book a big issue and challenge in learning the game. I fear the challenges of teaching, which I’ve discussed that other have had, have kept this from getting to the table. There are now PDF rulebooks available online. Once you know the game, it’s actually really easy to teach – you just play on Easy mode and pause each action as it happens and explain what it does. How long does one game usually take? We’re talking 90-120 minutes or so.